The coins are beautifully struck in .9999 fine 24-karat gold to celebrate Adolph A. Weinman’s original Winged Liberty Dime design. 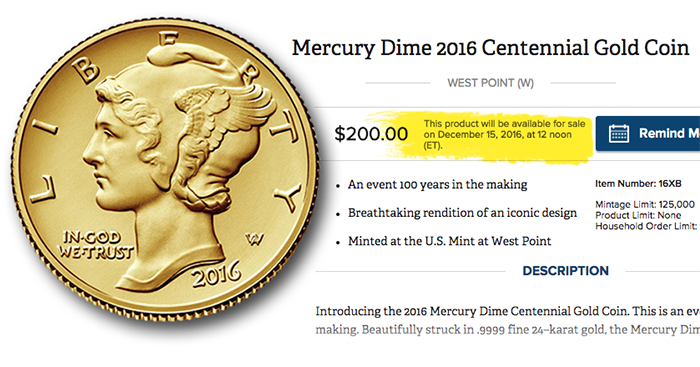 The coin is commonly referred to as the “Mercury” dime because of Liberty’s resemblance to the Roman god Mercury. Each coin contains 1/10 troy ounce of 24-karat gold, symbolic of the coin’s denomination of one dime, and is struck with a business-strike finish. The obverse features a portrait of Liberty facing left, wearing a winged cap, with the inscriptions LIBERTY, IN GOD WE TRUST, 2016, and the artist’s initials, AW. The reverse includes a Roman fasces and an olive branch, symbolizing America’s military readiness and desire for peace. Inscriptions are UNITED STATES OF AMERICA, E PLURIBUS UNUM, AU 24K, 1/10 oz., and ONE DIME. Orders will be accepted at the Mint’s online catalog at https://catalog.usmint.gov/ and at 1-800-USA-MINT (872-6468). Hearing- and speech-impaired customers with TTY equipment may order at 1-888-321-MINT (6468). Information about shipping options is available at https://catalog.usmint.gov/customer-service/shipping.html.